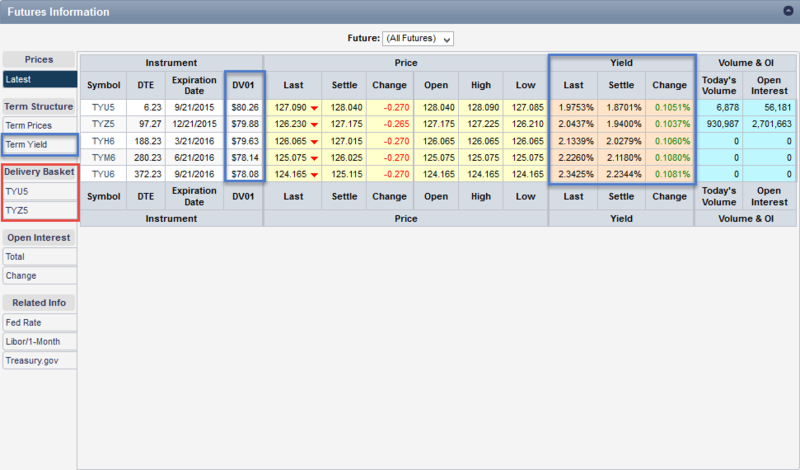 QuikStrike now displays the current and settle values for yield and DV01 (dollar value of a basis point) on the Futures Information page. The four callout boxes on the following graphic highlight the new treasury specific information. The DV01 has always been a “behind the scenes” number in QuikStrike. However, now that we are calculating this value each day, we wanted to give it the attention it deserves. As an essential part of the basis point volatility (BPV) calculation for treasuries, an accurate and up-to-date value provides users with our most accurate BPV calculation to date. 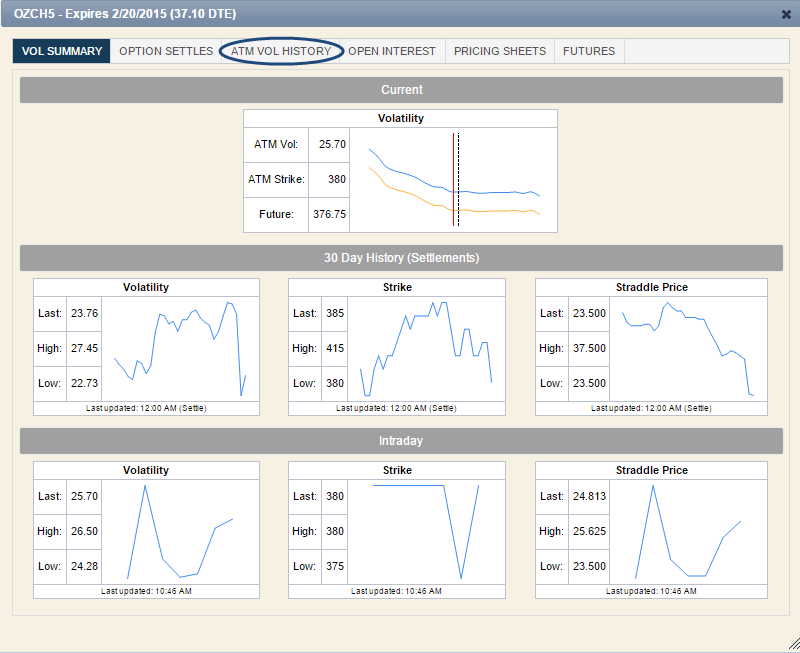 With the yield now available in QuikStrike, users have one more way to look at futures levels and/or create strategies. For instance, instead of a strangle with references to strike prices, you can create these spreads with the yield or its range it mind (by seeing the yield equivalents of each strike). It’s one more way Of using QuikStrike to build strategies or just generally think about the market. Each night, the yield and DV01 are calculated from the current CTD (cheapest-to-deliver) given the existing basket of deliverable treasuries. This (settlement) yield and DV01 will be used to calculate new yield values as the futures move throughout the following trading day. NOTE: This yield will soon be displayed wherever a futures price or table is available. And, Pricing Sheets will have yield values for each strike. You will also notice, in the red box, a tabbed section named Delivery Basket. Each currently active future will have a corresponding tab with a list of deliverable treasuries into that future. Each list will be ordered with the CTD at the top in ascending DV01 order. A Term Yield tab has also been added plotting the yields by future. Should you have any questions or suggestions or would just like to chat about QuikStrike, please let us know. In wake of Monday’s USDA report, the CME Group tweeted a QuikStrike ATM Vol History graph to showcase lower volatility in the March contract for Corn. Viewing this chart in QuikStrike takes a few simple steps. In a prior blog post, we outlined the features of the History section in QuikStrike. 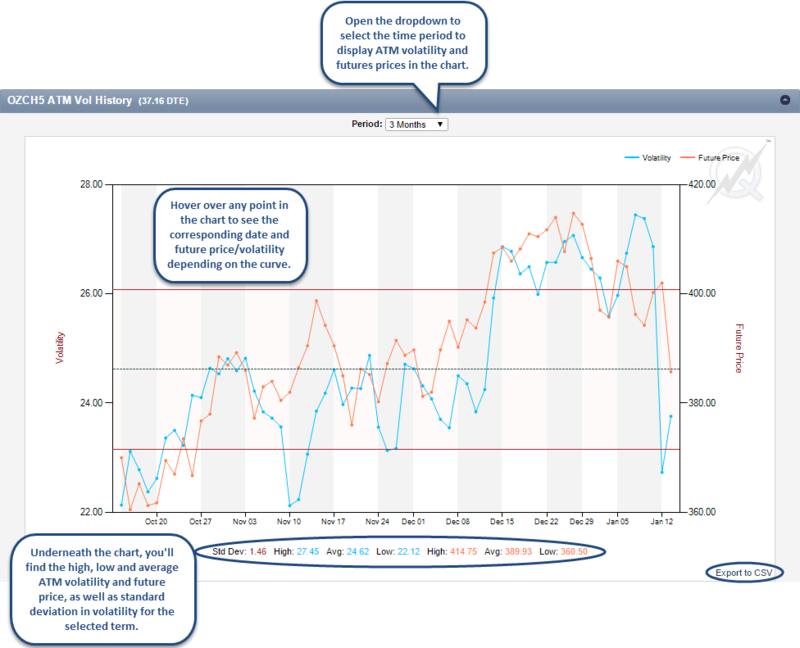 Navigating to the Volatility and Skew → ATM Charts page will allow you to view ATM volatility history (1,3,6,9 and 12 month periods), as well as the corresponding Future Price for each date. As you can see in the image above, the ATM volatility history chart gives you the opportunity to view the ATM volatility/future price and the corresponding date (going back as far as 12 months). You can also get a feel for the average ATM volatility and future price for a particular expiration over the selected time period at the bottom of the page. While we navigated to the History section of QuikStrike to create this graph, you can also access this information (via an Expiration Popup) by clicking on the expiration in the title bar (or any other place where the expiration is a link in QuikStrike). After you click the expiration, you will see the third tab from the left is ATM Vol History (as shown in the image below). Once you click the ATM Vol History tab, you can view the exact same chart as the Volatility and Skew → ATM Charts page in the History section of QuikStrike without navigating to a new page. 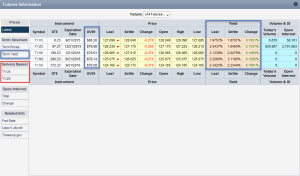 The Expiration Popup (shown in the image above) also includes Vol Summary, Option Settles, Open Interest, Pricing Sheets and Futures tabs for the selected expiration. 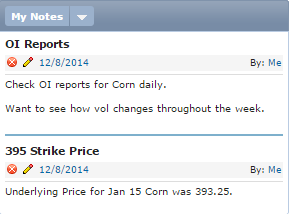 We want our users take advantage of all the ways to view vol history in QuikStrike. Let us know what you think about this chart, and the rest of the Volatility and Skew history pages. Get in touch with us via email, Twitter or post a comment below. Thanks for checking out our blog! Have you ever been using QuikStrike and wanted to make a quick note or remind yourself to revisit a page at a later date? In our latest build, we have created a new function called “Add a Note” that can be found on the right hand side of the toolbar. Clicking the Add a Note icon will open up a box on the page in which you can title and write a note for yourself. 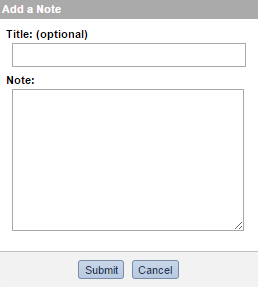 Once you have completed your note, click “Submit” and it will be saved to your “Notes” repository. This can be viewed by selecting My Notes from the dropdown menu in the sidebar or by clicking on the Envelope icon (second icon from the right) on the product menu line. Each saved note will be sorted by date. Clicking the “X” will allow you to delete the note and the “pencil icon” will enable you to edit the note without leaving your current page in QuikStrike. The My Notes section is a great opportunity for our users to keep annotations inside the tool and provide quick tips that can aid the QuikStrike experience. How do you foresee yourself using notes? Maybe you have some ideas that we have yet to consider. Drop us a line at info@quikstrike.net. We love getting your feedback! We all have our favorite pages in QuikStrike, and we want our users to be able to navigate between them quickly and efficiently. The recent creation of Menu Shortcuts provides our users with a simple interface to organize their “favorites”. We have moved the Star to the left hand side of the main menu. By clicking on the Star, users can create their own custom shortcut link to the current page. Once created, you can name the shortcut whatever you’d like or use the default provided by QuikStrike. To access your shortcut menu, click the Dropdown icon next to Star to reveal your new, custom menu. Clicking the pencil on the top right of the menu will allow users to edit the items within the drop down (be sure to click on the item to start editing). Users can create their own custom sections, drag existing shortcuts back and forth between sections and rename or delete shortcuts or section names as necessary. If you haven’t taken advantage of favorites in the past, please give the new Menu Shortcuts functionality a try. It’s easy to use! Let us know how you feel about the recent change. You can always send feedback, about this feature or any other, by sending us an email at info@quikstrike.net. One of the new features we have recently added to QuikStrike is the ability to limit your pricing sheet strike listing by Delta range. We incorporated this mode into QuikStrike to give you a targeted or relevant view into a particular expiration. You can set this globally via your personal QuikStrike preferences or on an individual expiration basis. Simple additions like this are easy to implement for us. With that in mind, we want to hear your feedback on our product and how we can improve upon it. Email us at support@quikstrike.net. Keep an eye out for more blog posts about how we are making QuikStrike better for our users.